The Stiebel Eltron Tempra Series of electric tankless water heaters provide an endless supply of hot water on demand to your whole house while saving you up to 50% off your water heating cost! Not all tankless water heaters are created equal. We are proud to carry Stiebel Eltron's Tempra Trend and Tempra Plus Series whole house electric tankless water heaters. They offer unsurpassed value and unmatched performance. No other electric tankless water heater offers Stiebel's industry leading thermostatic temperature control and dynamic flow control technologies. 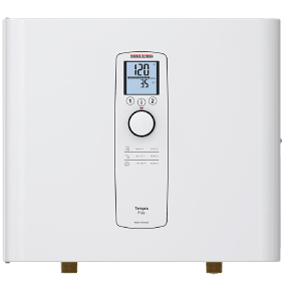 The Stiebel Eltron Tempra and Tempra Plus electric tankless water heaters use a sophisticated thermostatic temperature control system that constantly monitors the incoming water flow and temperature to modulate power to the heating elements and maintain a precise, user-set temperature. Convenient controls allow you to set the output temperature to your desired level (between 86 and 140F [30 to 50C]). Most competitor's tankless water heaters are not able to compensate for changes in water flow rate and temperature, making their units fluctuate when simultaneous water demands are run, when well pump pressures change, etc. This is because their systems operate either on a "full on / full off" basis or they have relatively crude power modulation technology. Tempra Plus Series models take temperature control to another level, offering the industry's only Advanced Flow Control Technology. This technology automatically adjusts the flow of water when the unit's sensors detect that the flow demand is exceeding the heater's capacity. This feature is particularly useful in cold climates and other applications where the electrical service size does not permit the installation of a larger model and it may be desirable to handle occasional high flow demands. It is also desirable where high output temperatures are required for temperature-critical applications (commercial dishwashers, etc.) where flow rates are not always predictable. Stiebel Eltron manufactures Tempra and Tempra Plus Series models for almost every conceivable water heating application. All Tempra Series models are essentially the same except for the maximum heating power. Similarly, all Tempra Plus Series models are essentially the same except for their power rating. They differ only in the quantity and power rating of the heating modules. The most appropriate model for each application is generally a function of your incoming water temperature (where you live), your water usage needs, and what features you desire. Please use our model selector or call us toll free at 1-877-374-2696 to select the best tankless water heater model for your application. Stiebel Eltron tankless water heaters are designed to completely replace your conventional hot water tank. They can also be configured in parallel or in series with conventional tanks (or multiple tankless units in series) for certain high-volume or commercial applications. You can purchase a Stiebel Eltron water heater with confidence! All Tempra and Tempra Plus models are manufactured in Germany at Stiebel Eltron's ISO-9001 certified factory. Nobody knows electric tankless water heaters like Stiebel Eltron, which has manufactured electric heaters since 1924! At E-Tankless.com, we take great pride in offering the very best products and prices to our customers. We will meet or beat any advertised price for Stiebel Eltron tankless water heaters on the Internet and all of our prices for the Tempra and Tempra Plus Series now include shipping at no extra charge! Please call our toll free customer service line at 1-877-374-2696 to order.